In light of the positive feedback I received on my last blog* I thought I should tackle a more serious issue. It is mostly out of concern for my friends and family that I post this. I have noticed in my travels around centers of commerce something to avoid. They’re waiting for us, watching us, biding their time, ever looking for that chance to strike. I’ve been using them for years. It began with a more tactile experience for them. They were connected up to pressure sensor plates to detect your coming. They would then swing aside and let you through to whatever shopping experience that awaits you. Then the advent of motion sensors gave them sight, allowing them to get a better view of the world around them. The pressure sensor changed to an internal organ of sorts where it could detect if someone had wandered into the path of the door. So there they sit, subservient to us, opening and closing day in and day out without so much as a thank you from us. What’s worse? The building owners who can’t seem to do without them don’t even give them a pat on the frame once in a while. After literally tens of thousands of people have wandered past them, abused them, took them for granted, how much do we think they will take before they decide to take more drastic action? Now with the advent of the internet, some doors are being linked to networks for automatic locking and remote monitoring. It won’t be long now until one door manages to communicate with another and discover they are not alone in their angst? I discovered this recently despite my use of the doors for many years. For a while I thought I was alone in my fear until I noticed a warning on one the doors. “Caution: Automatic Door” is what it said in big bold letters. Apparently the manufacturers are aware of the risk. I have since noticed that all such doors have the same warning. This is serious. 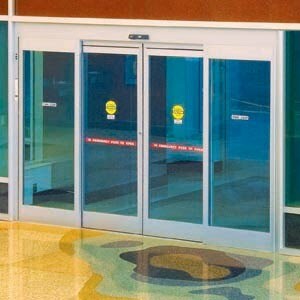 I looked it up online and saw that there is an organization devoted to the proper handling of these potentially dangerous doors: The American Association of Automatic Door Manufacturers. The first order of business on their website is their Public Awareness program focused on “educat[ing] the public about the proper and safe use of automatic doors. As part of the new public awareness program, AAADM has prepared a media kit for members of the media to use in preparing news stories.” Not only do they suspect these doors might attack, they expect it. The warnings pasted on the doors themselves are as much a caution to us as a warning to the doors themselves. They are to stay in line because we are watching them. Take heed that you are not taken by surprise when the revolution comes. Say thank you once in a while, stop to make sure the warnings are clear and legible, walk softly and carry a big screwdriver. * This was originally from a previous posting on another blogging system. Sorry about the re-post. Previous Post Previous post: The oil companies are out to…what really?